The school was established in 1978 by Mr. F.J Bentley who was a pioneer of private education in Kenya. Its situation is Nyali, a prime residential area, ensured that its population was drawn from the large number of expatriate families residing nearby. The school buildings consisted of the ground floor of the Headmaster's residence, seven classrooms and one laboratory. In 1980 the school's half-olympic size swimming pool was completed, followed by the Music and Mathematics rooms in 1981. The school's multi-purpose Assembly Hall was built in 1982 and a further 2.5 acre plot across the road was acquired in 1984 for playing fields. In 1986, the school changed hands following the sudden illness of its founder. The new owner, Mr. Prem Prinja, injected a substantial amount of capital into its infrastructure, equipment and landscaping. Sea View Road was tarmaced. A new Secondary block comprising six classrooms, an audio-visual room, a Biology Laboratory and an ablution block was built in 1987. 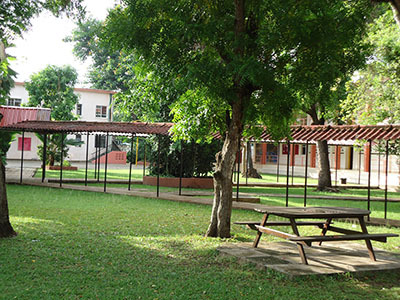 After completion of eight classrooms in 1989, the Junior school comprising the Lower Kindergarten to Year 2 was moved from the main campus to the adjacent plot. On this same site six studio flats for teaching staff were erected. Since then a further fourteen flats have been added.